Sicily's eclectic history inspired the Polish composer to fuse a variety of different styles in his masterful opera. It wasn’t always his homeland that inspired Polish composer Karol Szymanowski. In his masterpiece Król Roger he drew inspiration from a place far from home – Sicily. The island epitomizes the great cultural diversity of European history: while today it is a part of Italy, through its history it has fallen under Greek, Roman, Byzantine, Muslim, Norman and Spanish rule, and still bears traces of all these periods today. Perhaps it should come as no surprise that Szymanowski found the island so fascinating – in a sense, its patchwork architecture is a physical equivalent of the staggering range of musical styles and influences that composers were exploring in the early 20th century. Szymanowski’s early music – including his first two symphonies and piano sonatas, and the short opera Hagith – is most indebted to German Romantic music by the likes of Wagner and Richard Strauss. This changed in the early 1910s, a period that also gave us such startling modernist masterpieces as Stravinsky’s The Rite of Spring, Schoenberg’s Pierrot lunaire and Bartók’s Duke Bluebeard’s Castle. In 1911, Szymanowski visited Sicily for the first time; in 1914 he returned, and extended his trip to include Algeria and Tunisia. His travelling proved to be a major source of inspiration during the war years, which he spent with his family in Ukraine. His memories of the exotic aura from his foreign travels mixed in his mind with the impressionism of Debussy and Ravel and the wild mysticism of Skryabin. Written in 1915, the set of three Myths for violin and piano shows this new influence clearly. The first of these, ‘Fountain of Arethusa’, is named after the location in Syracuse, Sicily, where the Greek myth of Arethusa is said to have taken place. With its flowing piano part and ecstatic writing for violin, this short piece shows perfectly how Szymanowski transformed his fascination with Mediterranean culture into music. Two other cycles from the same year, Metopes for piano and Songs of a Fairy Princess for voice and piano, also show this radical compositional change. Król Roger dates from a little later. The idea for the subject first came to Szymanowski in 1918, in the last few months of World War I, after the October Revolution had destroyed his family home in Tymoszówka. Re-imagining the life of the twelfth century Roger II of Sicily and drawing on Euripides’ The Bacchae, this marvellously original opera shows many similar Mediterranean influences to his 1915 cycles – from the magisterial choral opening, depicting a Byzantine church service, to the exotic melodies and prominent percussion of the central, ‘Oriental’ act. By the time Szymanowski completed the opera in 1924, however, his music had changed in style again. With Szymanowski newly inspired by Polish folk music and his own national history, Act III combines some exotic elements reminiscent of the earlier acts with a discernibly Polish style. But while this might sound inconsistent, the shift perfectly encapsulates the changed mood of the opera itself, in which King Roger, having been tempted by the wild allure of the Shepherd, resolves to follow his own path. There are great works later in Szymanowski’s career, such as the beautiful Stabat Mater of 1926 – a Polish setting of the Catholic text, which strives to look back to Polish music’s past. But only Król Roger spans such a key period in his artistic development, and so vividly demonstrates the power of musical eclecticism. 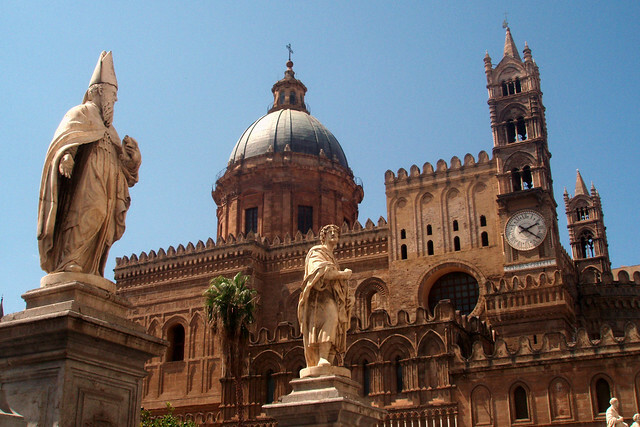 Just like Sicily itself, it is a fascinating fusion of styles. Król Roger runs until 19 May 2015. Tickets are still available. The full performance of Król Roger can be viewed from Saturday 16 May 2015 on the ROH website, on YouTube and on the Opera Europa Digital Platform, a new website to be launched early May that will showcase live streams and a range of behind-the-scenes footage from 15 opera houses across Europe. The production is generously supported by The Monument Trust, The Danish Research Foundation, the Adam Mickiewicz Institute as part of the Polska Music Programme, The Taylor Family Foundation, Hamish and Sophie Forsyth, David Hancock, Michael Hartnall, Susan and John Singer and the Connoisseurs’ Series.